I have been spending most of my time (which is after dinner) working on my dragon fly table runner. I am very pleased with myself./happy with the result/chuffed with the nearly finished item - take you pick. All that is left to do now is finish the edge. I elected to bottom hole it and all that is left is to cut away the surplus fabric. Because it is a very course linen the buttonholed edge has gaps, so, before I cut I am going to 'fray stop' the edge - i do want to use it as a runner on my table. Means I will have to clear my table first. When it is done I will put a photo up - should be by next week. In the mean time I am facing dead line for an art quilt for an exhibition in St Vincent's Hospital Exhibition Corridor. I have know for months and I have consistently baulked at doing it. I can't understand why. All that it requires is to big stitch quilt it - it doesn't profit me to avoid doing it - which I have done by finishing the table runner. 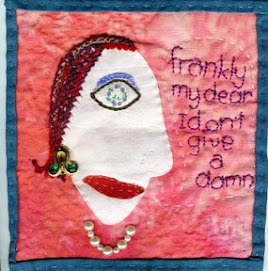 I shouldn't chastise myself too much though - I have been busy with other things - caught up in arrangements for two exhibitions in November at the local library for a challenge organised for members of the Embroiderer's Guild NSW to sync with Breast Cancer awareness and a major exhibition at the end of April next year. I missed going to Stitches Plus last week as some of my family was visiting - three generations of women in the one house - must say I enjoyed it immensely. Because the family is scattered , and the children are now young adults family get togethers don't happen that often. So any get together, even if it is not the full complement is enjoyed I normally don't put photos of people up but in this case I am going to - I am enormously proud of their personal achievements and love them madly. The women are my daughter, my sister , my mother and I. Cheers all - must go and try and clear up some of that dust that flew in on Monday ... and avoid that quilt just a little bit more.